I have a pet peeve with companies that follow a ton of people on social media and then unfollow everyone a few days later. While it's irksome when an individual does it, with a company it just comes off as a little tacky. We all know that the company is doing it to get massive amounts of people to follow them and then betting that most people either don't know how to check or don't care enough to unfollow the company once the company unfollows them. Then the company has 30,000 followers while only following 10 people. It looks bad. I wish that PR companies would do a better job of discouraging this behavior. Almost all the likes that they receive with this type of social media behavior won't be the ones buying their products, the followers don't equal profit. It's a much better idea to actually have a great product and offer coupons on social media, making people care enough to genuinely follow your company. I'm hoping that once companies get a better grasp on how to run social media effectively this behavior will begin to stop. However, as of now that isn't happening, it's pretty much a free for all. Since going gluten free I have tried just about every type of gluten free flour. Some have been okay, others kill my stomach (I'm referring to you soy and quinoa flours, no thanks). I've joked with my husband that I'm going to go to a straight steak and potato diet. It would taste awesome and my stomach would be happy. However, it would also cost a mint and variety is better for my health. 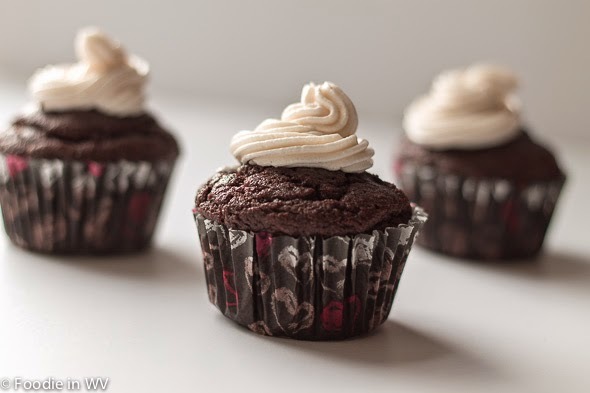 Coconut flour seems to be all the rage right now, so the following is my recipe for Coconut Flour Chocolate Cupcakes with Buttercream Frosting. Adapted from Healy Eat Real. Combine all ingredients in a food processor and blend. Allow batter to sit for 5-10 minutes. Place batter into a muffin tin either greased or with muffin liners. Beat butter and sugar with a mixer for 3 minutes. Add vanilla and cream and beat for another 1-2 minutes. If needed add more cream to get to a spreading consistency. If you've never used coconut flour before it absorbs liquid like crazy. You have to use a lot more liquid than flour in order for baked goods made with coconut flour to work. These cupcakes are a mix between muffins and cupcakes. The texture is somewhere in between. If you don't consume cows milk you could try using coconut milk in this recipe. I often substitute canned coconut milk in baking recipes and it works well. The coconut oil could also be substituted for vegetable oil, canola oil, or unsalted butter. If you like sweet cupcakes/muffins I would increase the amount of honey to 1/2 cup. Additionally the honey can be substituted for date or coconut sugar (or granulated if you eat it in your diet). The frosting obviously has butter and confectioners sugar so if you are avoiding either of those things you would want to make a substitution. 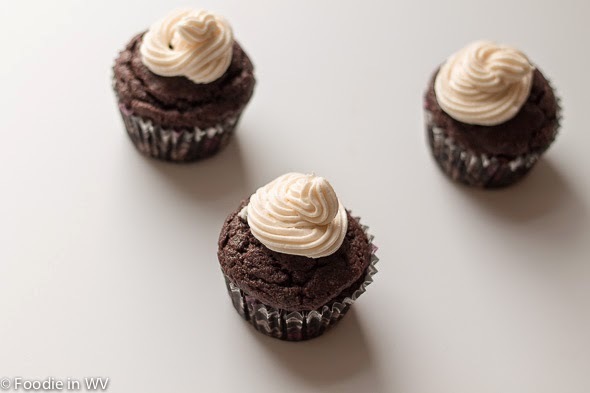 An easy way to make dairy free frosting is to whip a can of full fat coconut milk and a teaspoon or two of vanilla. 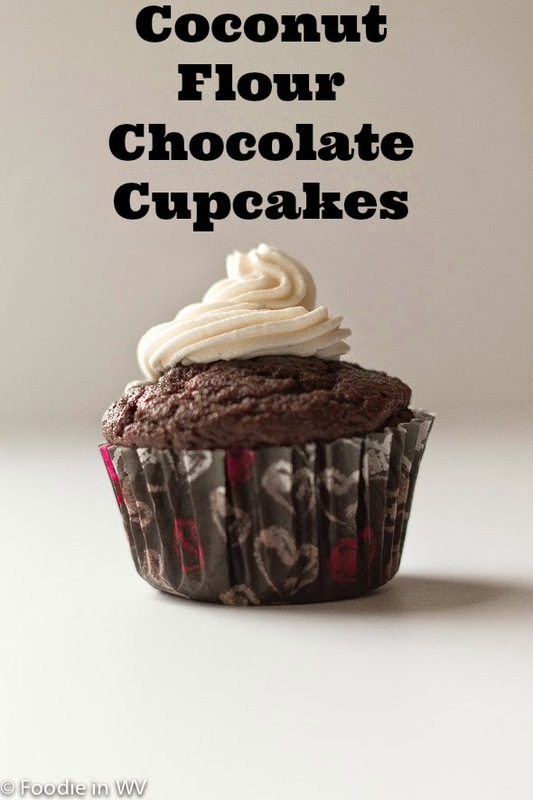 You can add cocoa powder (or cacao) if you are wanting chocolate flavored, approximately 2 tablespoons. These look adorable and delicious! Thanks :) Even my kids loved them! UGH!!!!!! I hear you about the follow/unfollow techniques of companies. I have other pet peeves about companies and how they handle getting followers/working with bloggers. But let's focus on the deliciousness of these cupcakes! I'm not GF, but I love using different flours in baking. The variety is always good! yes...hate that follow/unfollow tactic. very insincere. i've been exploring recipes for protein-packed treats (for my marathon training/protein intake) and many call for coconut flour! will definitely be trying it out. so i'm going to ask a dumb question...does it give off a coconut flavor in your baked goods? Coconut flour does have a coconut taste, so if you aren't a fan of coconut you probably wouldn't like it. It also has a more grainy texture than other flours, it's a little gritty. These look so delicious! I'll have a dozen! I have also been victim to companies who do that follow/unfollow move. It's shady and not right. Can your family tell the difference when you make them with coconut flour? Which do they prefer? I'm behind on replies sorry I didn't post back sooner :) My kids will pretty much eat anything sweet, my husband is the picky one in the family. He isn't a big fan of coconut so coconut flour always tastes too much like coconut to him. However, he will eat any of the things that I bake, he just prefers regular wheat flour. I didn't know there was such a thing as quinoa flour. Learn something new every day. :) And your cupcakes here look good too! Some people love it, but it does not agree with my stomach :) Quinoa is a big no no in general with me. It might be super popular right now, but my body just can't handle it! I hate that too. I have Just Unfollow and when they do that, I unfollow them too unless they are very interesting to me. I do the same thing :) I just hate having to go back and unfollow a bunch of companies/people, especially the big companies that should know better. These look so good! I always find coconut flour baked goods to be dry, so I usually prefer almond flour, but I'll have to try these! It can be dry, especially if you don't use enough liquid. These turned out really well though since the amount of flour was much smaller than the amount of liquid.